In large sauce pan, make the Cranberry-Orange Lager Beer Sauce by whisking together sugar, cornstarch, orange juice and Lager Beer until blended. Add cranberries. Over medium-high heat, bring mixture to boil. Reduce heat to medium-low and simmer 15 minutes, until sauce thickens slightly and cranberries pop. If serving immediately, keep warm, or cool, cover and refrigerate up to 4 days. In large bowl, make crepes by whisking together Brown Ale Beer, milk, eggs, sugar and butter until well blended. Whisk in flour and salt until batter is very smooth, about 2 to 3 minutes. Let batter rest 20 minutes. Preheat 8 or 9-inch nonstick crepe pan or skillet over medium heat. When pan is hot, remove from heat and spray with cooking spray. Add ¼ cup batter to pan. Tilt pan to spread batter into 7-inch round. Return skillet to heat and lightly brown crepe about 45 seconds, or until edges start to curl. Turn crepe over and cook second side 30 to 45 seconds longer, until lightly browned. Transfer to plate. Repeat with remaining batter to make 20 crepes. Crepes can be made several days ahead, stacked between layers of waxed or parchment paper, covered and refrigerated. Make ricotta cheese filling by combining together in large bowl ricotta cheese, honey, lemon zest, lemon juice and cinnamon. Stir well to blend. Filling can be made several days ahead, covered and refrigerated. To assemble crepes, preheat oven to 350 F. With cooking spray, lightly coat 2 shallow baking pans or dishes. 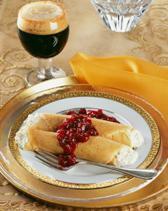 For each crepe, place 2 rounded tablespoonfuls of filling in the center of each crepe in a 3-inch long mound. Fold two opposite edges of crepe over top of filling, then fold in remaining edges forming a packet. Place in prepared baking dish. Repeat with remaining filling and crepes. Bake 15 minutes, or until heated throughout and slightly crisp. Top with Cranberry-Orange Lager Beer Sauce.